Nestled amongst dusty curio shops and bustling restaurants in the old walled city of Pingyao is the 19-room Jing's Residence, a small boutique hotel that is located in a nicely-renovated old mansion. The design of the hotel fits in harmoniously with the traditional surroundings of this ancient city. 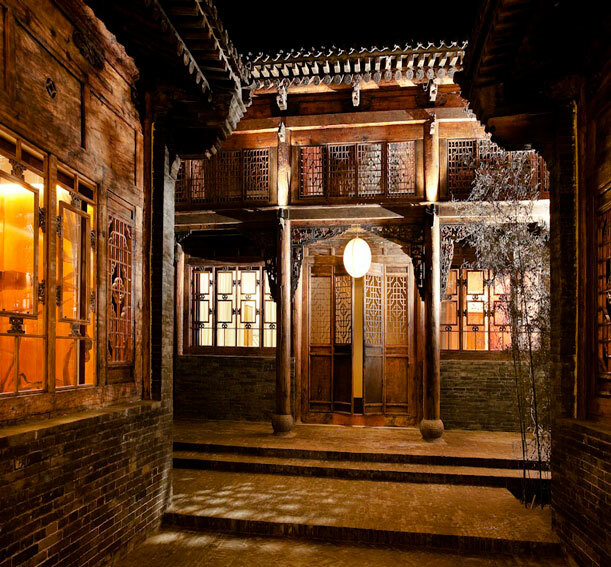 The Residence is ideally located in the heart of the old town and encompasses a series of grey-brick pavilions built around a set of four courtyards in the authentic architectural style of northern China. Tables and chairs are located outside each pavilion where guests can relax while reading, drinking tea, or soaking up the historical atmosphere. In addition to the luxurious accommodations, the Residence also features a dining room where guests can enjoy an extensive menu of international and local favorites. The Residence also provides an exclusive meeting space, a cozy library and a bar that make it the perfect home-away-from-home for discerning travelers. Unobtrusive landscaping features bamboo, a water element, white stones from northern China and traditional brick-paved walkways that connect the various courtyards. The dramatic lighting at night enhances the courtyard's almost palpable sense of time and history.